Forget about stressful searches for photos on your loaded iPhone camera roll. 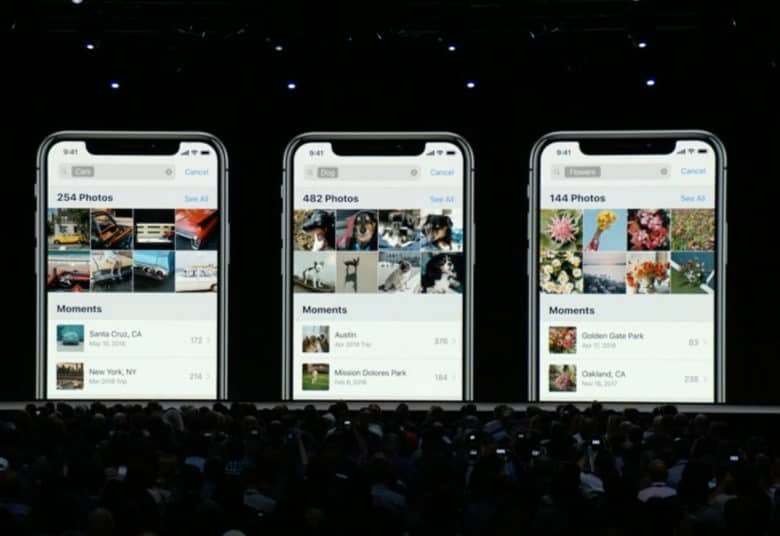 The Photos app will be smarter in iOS 12. Coming to Photos will be features that recognize objects, scenes and people, and make suggestions even before you finish typing your search. The new muscle, introduced by Craig Federighi, Apple’s vice president of software engineering at WWDC 2018 this morning, is powered by bolstered on-device machine learning that recognizes your photographic subjects. It will identify objects like flowers and the people you love, as well as locations your photos were taken. Photos will be able to index images in thousands of ways, like time and place. The app will also let you use multiple search terms such as “kayaking and vacation” or “hiking and mountains” to find the shots you want. Photos will even recommend effects you can apply to your photos (tastefully, of course). A new feature called For You will let you share full-resolution photos with a friend through the Messages app. Photos will then automatically search your friend’s camera roll for similar photos – especially if the two people made pictures at the same event – and recommend those photos be shared in response. Some observers on social media said the updated Photos app is similar to Google Photos. In introducing iOS 12, Federighi said the update will work on devices as old as the iPhone 5s.